Alice has decided that she needs a new coat just in case the weather turns really rough. It of course has to be red and she had her heart set upon a particular shade of red (she says just because I have no sense of style doesn’t mean she has to look like a raggamuffin – she just said she’s not talking to me and just for pointing out wigglypets don’t tend to wear clothes). 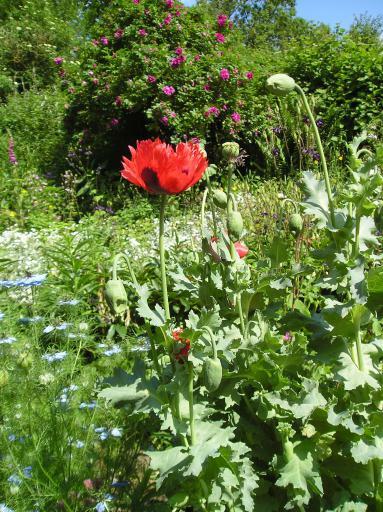 Anyway she decided that the large red poppies in the garden would do nicely – they even have a dark blue-y purple center that she thinks will make a nice collar. So we packed up our rucks sacks with rosemary cordial and honey cheese cake crumbs and set off. The poppy plants themselves are very tall and we had a small argument over whether they counted as trees or not (Alice would like me to point out that my silliness resulted the cordial being spilt all over her, I think this is irrelevant as the ants came and cleaned her up anyway – she says that’s not the point). Anyway, after lunch Alice climbed up one of the plants and retrieved a couple of choice petals – unfortunately they were the same size as her and she over-balanced (Alice says if I continue she won’t be talking to me again – she’s always mucking about like this). As she fell out of the flower the petals drifted gracefully to the ground (she says she’s warning me); she, on the other hand, went thump, boing, and got wedged in one of the branches of the poppy tree (THEY ARE NOT TREES, she says). In the end we had to go and get a human to rescue her. And then it turned out that we had ruined a perfect display and the human was sad but said we were welcome to all the petals on the ground. Humans can be so strange some times. Mind you, the humans’ wiggly woo (they call them babies! 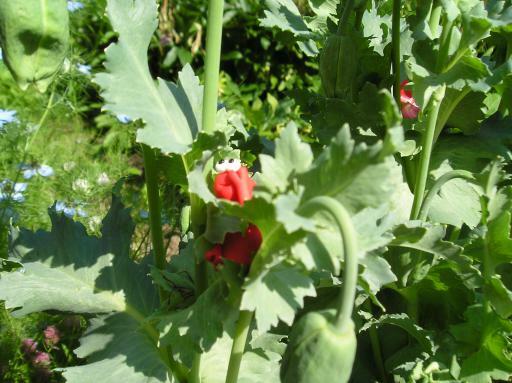 Silly creatures) is always in trouble for picking flowers so I guess we’re in good company – Alice? Alice? Where has she gone now?